Imagine you are laid back in the bath with a glass of wine and a good book, taking in the fresh surroundings of your bathroom. Sounds idyllic, but nasty sink and toilet blockages can quickly put a stop to this scenario. Now imagine you’re enjoying Sunday dinner with your family. Perfect right? But the kitchen is filled with pots and pans and cutlery because the sink is blocked! But fear not. Here at Churchford Property Care, we have compiled a simple guide to ensure your toilets and sinks remain unblocked and odourless, allowing you to sit back and take in your clean, fresh surroundings. Sometimes, you can get the job done simply by using water. For example, a bucket of water poured rapidly down a toilet or plughole can ease the blockage just through sheer force. Where water won’t cut it, it’s best to get in the heavy duty products. However, strong cleaners can be corrosive. We recommend following the product’s guidelines closely. 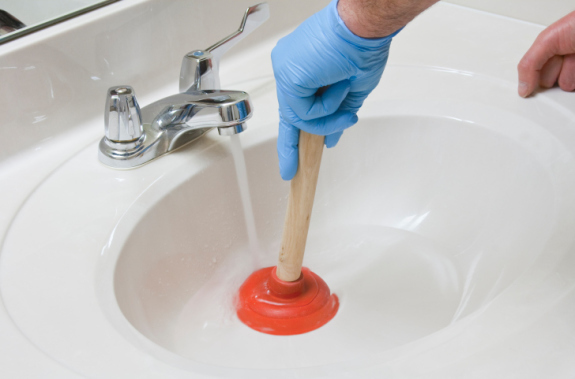 In addition, some cleaners may need to be left for a few hours (or overnight) in order to unclog excessive blockages. 1.Wear rubber gloves and pour chemical cleaner into the waste traps and toilet bowl. Alternatively, follow product guidelines to ensure safety. 2.A drain auger can also be used to dislodge clogs in the plumbing – remove a length of auger from the drum (approximately 1 m). 3.Tighten the remaining nut to ensure the device is securely fastened, you should then be able to manoeuvre the auger coil flexibly to ensure it slides up and down the toilet U-bend, and can dislodge and break up any blockage. 4.Once the blockage has been removed, clean all equipment thoroughly. Allow coil to dry properly before winding. 1.For blocked sinks, you will need a plunger and a cloth to block the overflow. Move the plunger up and down, whilst simultaneously holding the cloth in position. This should create a vacuum, which in turn should unblock the sink. 2.If the plunger does not work, unscrew the sump section of the basin trap underneath the sink – warning: there may be overflow so be sure to catch excess water with a bucket. 3.Remove any visible waste/debris that appears to cause the blockage, ensuring rubber washers are correctly placed. 4.If this step fails, you may need to venture further into the main part of the trap and access the waste pipe. 5.A drain auger may be used to bend round the pipe system and dislodge any clogs – as with the toilet unblocking. Reassemble pipe fixtures and clean equipment accordingly. If you’re in need of professional and cost-effective plumbing or electrical work in Exeter, give us a call!